Laura Wang wears many hats as Project Manager at the seed level startup, Kevala Analytics. Kevala is focused on mapping distributed energy resources on the grid and Laura is currently working to develop new product offerings. Laura also spent the last two years as CELI’s San Francisco Deputy Director as well as the Selections Committee Chair for three semesters. We caught up with Laura to learn about how she became involved in CELI and hear what advice she has for young professionals looking to apply. Tell us a little about your career path. How did you get started in clean energy? In college I was an environmental studies major with a focus on marine and coastal conservation. As I continued to realize the scale of the climate change challenge, I began to ask myself how I could most efficiently make the greatest impact. I thought marine conservation would be the impact I would have until I moved to Sacramento. Right out of grad school, I had a Fellowship opportunity in Sacramento where I worked on Jerry Brown’s climate and energy team. California is such a leader in clean energy, it was the perfect opportunity to learn how to craft and implement really ambitious policy. It was then that I began to understand how tackling the problem in California can have rippling effects across the rest of the nation and developing countries. In that role, I had some really amazing mentors who helped me understand the lay of the land and encouraged me take on meaningful work. They showed me how having strong leadership at the top who are driving climate and energy climate policies can really make a huge difference. What have been some challenges along the way and how did you overcome them? The interesting thing about the scope of international work is it gets quite difficult to see tangible results. Anyone working in climate negotiations will tell you is it takes years to reach an agreement and then even longer to see the results of the policies being enacted. It’s important to know if tangible results are something that motivate you since they’re not always a guarantee. I also think that the tricky part for a lot of young professionals who are super passionate about climate change but not super technical is that energy can be really intimidating. I really felt that while working on international climate projects in DC and was looking for a way to better understand the technical side of the industry. CELI was the perfect fit because I was also new to the area and it provided a community of like minded friends. I applied and became a Fellow in Fall of 2014. You played a big role in making CELI what it is today. What was it like growing the organization? Right after my Fellowship ended I moved to Samoa for the Fulbright Fellowship. What really astounded me about CELI was that even though I wasn’t talking to them every week, we were still having these really great exchanges. Across the world, it still felt like this network that I was connected to and benefiting from. CELI was like the gift that kept on giving in my personal and professional life. Jackie and I happened to move back to California at the same time and talked about the expansion plan over lunch. She asked me to help out and it really just ballooned from there. I saw a unique opportunity and value proposition with CELI. None of us had a huge network out here but really believed in the core values of CELI which drove us to overcome the challenge of lining up that first semester of speakers. One of the most exciting parts was having a speakers say yes to volunteering their time and then tell after that they are so impressed that an organization like CELI exists. Now, to see so many speakers come back is such a huge measure of success to me and an indicator that what we’re doing is something people really do care about. Why is the work CELI does important to you? In the energy and transportation sector, collective action and continuous learning are critical. It’s really important to understand the people on all sides of the table and the leaders across the spectrum. If you work in solar development and never speak with someone at the utilities you risk missing the opportunity to reduce emissions more efficiently. We need young leaders sitting at each part of the table and this part of CELI’s mission is increasingly important as the threat of climate change accelerates. The CELI curriculum has evolved every semester because the industry is evolving so quickly. When we started out, we didn’t have a clean transportation session and rarely talked about energy storage. Now these new opportunities are a core part of the curriculum. To have a program that continually updates its network of leaders is unique and really impactful. We’re at this really cool time where people who were Fellows a few years ago are becoming more contributing alumni. Alex Harbour is an amazing example of someone who had six months of work experience when she applied to CELI and now she’s the coach of the business pitch component. She has this incredible skill set that she gives back to the network while continuing to hone the skill set for herself. It’s wonderful that the vision we’ve set out for ourselves, where Fellows are the leaders sitting at the table, is slowly coming true. What recommendations do you have for someone looking to become involved in CELI? I’ve served on the Selections Committee for four semesters and been the Selections Committee Chair for three semesters. Meeting so many perspective fellows is always really fun. We always get way more applications than we can take, unfortunately, so for people looking to apply, I really encourage dedicating time on the application. I think the value proposition of CELI is really hard to get from the website. I encourage people interested in the program to go to the informational happy hours and learn from Alums what the real value has been for them. Then include what you learn in the application as much as you can because it’s immediately evident in the writing whether or not you understand what the CELI program is all about. My second piece of advice is don’t underestimate the leadership component of the program’s name. Yes, we’re looking for smart, young professionals but we are also looking for people who can be the leaders in our industry. How do you identify young leaders as a good fit for CELI? In purely a resume form it can be at any level. It can be as simple as taking initiative on a project at work or showing leadership at a club or extra curricular activity. It can also be understanding that there is a much larger vision of the clean energy transition and showing CELI what you envision your role being. Out of all the industries, clean energy is the one that needs people who want to take action and do it quickly. We look for people that have that kind of initiative. We really have come a long way as the Clean Energy Leadership Institute. I feel incredibly proud of what we’ve built and the number of Fellows we’ve raised. When we started in SF, we honestly didn’t know how many people would apply. It wasn’t until applications closed that we were like, oh my god, 150 people applied! It was then that I realized, we had started something amazing. 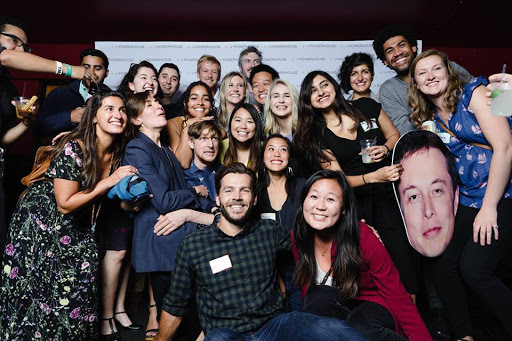 Take Laura’s advice and join us this Wednesday, January 9th in downtown San Francisco to meet CELI Alumni and learn more about our Fellowship.